Should Single-Coil Implantable Cardioverter Defibrillator Leads Be Used in all Patients? When is Device-Detected Atrial Fibrillation Actionable? His Bundle Pacing: Is It Ready for Prime Time? This issue of Cardiac Electrophysiology Clinics--edited by Drs. 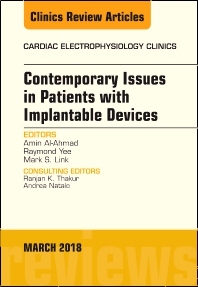 Amin Al-Ahmad, Raymond Yee, and Mark Link--will focus on Contemporary Issues in Patients with Implantable Devices. Topics include, but are not limited to: Management of Device infections; Device longevity; Inappropriate ICD therapies; ILR for cryptogenic stroke; ICD implantation without DFT testing; S-ICD; Lead extraction; Use of the WCD as a bridge to ICD; Important parameters for ICD selection; Leadless pacemakers; Management of perioperative anticoagulation for device implantation; HIS bundle pacing; Single coil ICD leads; Venous system interventions for device implantation; and Remote monitoring.